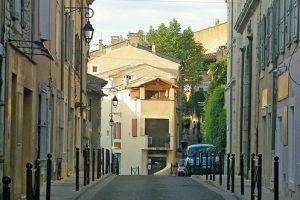 Our 1300-square foot, three bedroom/two bathroom, newly-renovated apartment is located in the center of Bonnieux, one of the most delightful and authentic villages in the Luberon area of Provence. With beautiful views across the valley, Bonnieux is an excellent base for exploring Provence and enjoying the good life in the French countryside. Our apartment is available for weekly rentals year-round. We’ve named our apartment “Bonheur en Bonnieux” (Happiness in Bonnieux), because that’s how we feel when we’re here. We hope you’ll feel that same sense of “bonheur” when you live for a week or more in our comfortable and well-equipped apartment. Everything you need for daily life is located just a five-minute walk from your front door: two boulangeries (bakeries), many cafes and restaurants, a small village supermarket, a butcher shop, a pharmacy, post office and ATM, and the weekly market on Friday mornings. The buildings are 250 years old, but our apartment was completely renovated and decorated in 2012 and offered for rentals beginning in April 2013. Our ground-floor bedroom suite was renovated and decorated in 2016. With three bedrooms and two bathrooms on two floors, our apartment is ideal for solo travelers, couples, small groups of friends, and small families with older children. We welcome a maximum of five guests. If you’re a solo traveler or small group, we can shut off part of the apartment and offer a discount. Rentals are normally for a full week: Saturday to Saturday most of the year; Monday to Monday in July and August. Many guests stay for two weeks, some even longer! We spend several months a year here, so it’s our Luberon home, not just a rental. We’ve made it really special for us and for our guests. Our apartment is full of light and color and decorated with local art. We have an extensive personal library of books, guidebooks, maps, and movies, and our detailed housebook includes all our personal recommendations for enjoying the Luberon. You’ll especially enjoy our large, well-equipped kitchen and the adjoining covered terrace where you can relax over a meal, sip a glass of wine, and observe daily life in Bonnieux. We know sometimes there is a “leap of faith” when renting directly from an owner. 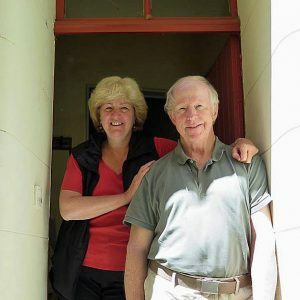 We’ve been leading small group tours in Provence and other areas of Europe for 12 years through our company European Experiences, and we’re well-known in the travel business. After five seasons of renting our Bonnieux home, we have many reviews from guests who have enjoyed our apartment. Several guests have already returned for a second and third stay. We’re happy to provide references or to talk with you by phone. Booking now for 2019 and 2020! See our Calendar for our open dates in 2019 and 2020.